Just by chance I thought I’d check the Ice Fishing forum and I see the last post was 5-Feb-2013. Folks just do not use this forum as they do the one I use in the summer time fishing Lake Michigan namely Lake Link which I regularly post my salmon fishing results on. With very little free water to fish, here in the Peoria area, I mean where you do not have to pay or know of private water someone will let you fish, I understand why fisherman do not let the cat out of the bag as to where they fish. At least maybe we can discuss what we use and methods. I’ve been useing Vexilars fishing through the ice for a very long while and do not go on the ice without mine. My last one I bought was the FL-20 and I also still have the FL-18 which I think is great but use the 20 most of the time. I use mostly horizontal jigs and either hang maggots or just plastic wedgees on them. The wedgees I use I make myself and the white and bubblegum colors work well on both crappies and gills but the watermelon with glitter is sometimes prefered by gills. My friend in Wisconsin swears by his purple plastics. The maggots I buy from Vados Baits in Minnesota, 2000 at a time and they keep for weeks when refrigerated close to 33 degrees but not below. (Do Not tell the wife what they are) I prefer maggots because they are tough and stay on the hook better than waxies, just my choice. I either use the 1/64th oz jigs that I make myself or a great tungsten jig, Fiskas, just check them out at yourbobbersdown.com and you will find them a little pricey but a great panfish jig in sizes 3mm and 4mm. I mostly use 3mm with size 16 hook and 4mm with size 14 hook. I just ordered to replentish my supply and ordered some 2 1/2mm with size 20 hook to try on those finicky biteing fish. Most of you my not have seen a size 20 hook but they are ultra small and will be a great match with just one maggot for that finesse presentation. My auger is the Strikemaster Lazermag 5 inch that drills the size hole I prefer. I have gotten 2 lb crappies and 3 lb channel cats through the hole but they were a squeeze. I just look for the panfish. I have a 5” Lazermag aguer that I have a special attachment that Will accept my 20 volt battery drill and is great for drilling many holes for hole hopping which is the secret to catching more fish. Most of the time I only move 5 or 6 feet and keep catching the fish. When a hole stops producing move to another, do not die in just one hole. This is where the Vexilar tells you when to move and when to stay. PS: When I’m using Fiskas, I use mostly the Fiska Wolfram Hand Painted Jigs in colors HP32, HP36, HP41, HP43, HP44, HP45, HP55 and the metallic GB86 which is plain gold, none of these have the little beads behind the jig body, just my preferance again. A lot to choose from, thought I’d let you have a starting point. Jamie is great at getting orders out. These jigs are used one hell of a lot by the guys fishing the ice fishing tournaments. Go to icemasteradapter.com to view or order the battery drill to iceauger adapter I am using. It’s been great for me. I wish we could post pictures on here. The cell phones take great pictures and Pictures Help very much. Andy I found the tutorial and it requires the use of FaceBook which I do not use so I guess I cannot post pictures at this time. I have not tried selecting from my pictures in my albums as I do on other websites or emails. Oops sorry Andy I miss read and see I can use Photobucket——Thank You. On the Ice at 7:30 and off at noon with a nice catch by myself. I used the battery drill aguer setup and drilled 24 holes, none were more than 6 feet from the last. Kept 23 fish, 19 gills, 3 red ears and 1 crappie. A good bite to start with 6 fish out of one hole but only one nice gill after 11AM. Started with a 4mm HP32 Clown Fiskas with 2 spikes (maggots) just pinned on their flat end so they wave in the water and had some refusals seen on the Vexilar so I switched to a 3mm HP36 Parrot Fiskas with the 2 spikes and started catching fish. The down sizing made the difference for me. My point is sizes sometimes makes a big difference and mainly that I drilled 24 holes to catch 23 keeper fish. The Vexilar can tell you when to move out of an inactive hole and stay in an active hole. I fished a stripmine and stayed in 13 foot depth at edge of the dropoff most of the time. Did not measure but the Ice was around 10 inches. What are your reels of choice and line size preferred? Panfish are my target and I only really care to get a larger bass or channel cat through the hole simply to get my jig back. I have about a dozen expensive spinning reels sitting in a box that I no longer use. 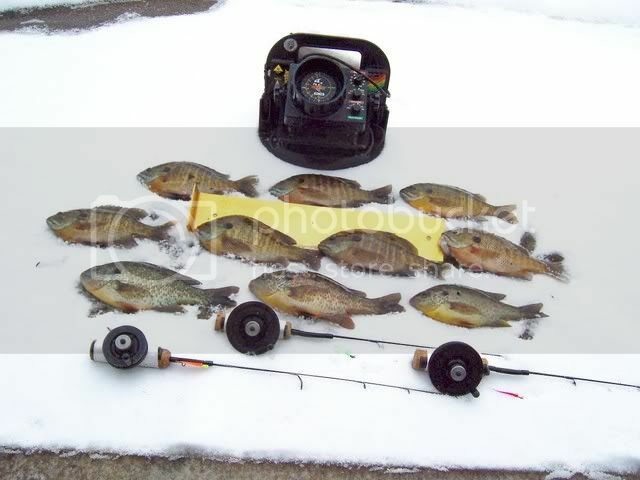 Two of the reels have 6 pound test on them that I used on Lake of the Woods in Minnesota to catch walleye and sauger and an occaisional ellpout and after one day of fishing on that week trip I down sized to 4 pound test that did the job up there. Now I’ve replaced the spinning reels with either Schooley or Slater plastic ice fishing reels that are to me easier to pack around, easy on my old wrist to hold and jig, as cheap as can be had, and mostly permits lowering your jig with the least coiling of the line. 2 pound line does the job for me as I have very few break offs and as the line is pulled off the reel there is much less coiling or line going down the hole in a spiral fashion. The straighter the line from rod tip to jig the better the bite detection. Many of days I have had friends fishing with me with old and usulally heavier line on their rods and they did not have the slightest clue why I could detect bites and they could not. With all the slack in their line between rod tip and jig they had little notifiction of a bite unless the fish moved off with the jig. Putting split shot on the line is not the answer. Every one has their likes and these have become mine. Nice short ice rods with my little plastic reels taped on loaded with fresh good 2 pound test line that has little memory so the line goes straight down the hole. I’m fishing down to 20 feet regularly and at times deeper and these rigs do the job for me and put a lot of fun in my fishing. There are some reels on the market like little light weight fly reels but I’ve not tried them.